Images of soil erosion , where 12 slideshows of features of soil erosion can be viewed. This site is about soil erosion control in Europe. 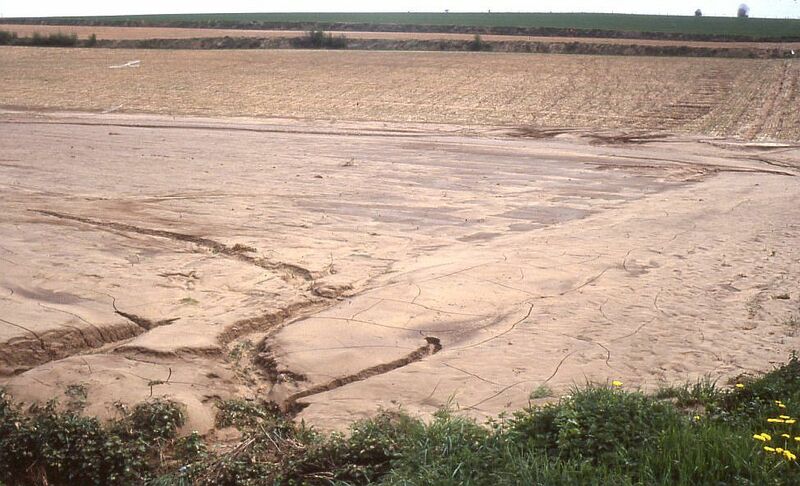 Soil erosion is as old as agriculture. Stated in simplest terms, conservation of the soil is a matter of using land as it should be used. Proper use of the land is governed by certain physical factors. When it is used without regard for these factors, the processes of waste begin. Certain factors of an economic and social character also influence the use of land. Men who farm the land must make a living. That is their most realistic and immediate concern. Economic need is a powerful factor in determining how they use the land, a factor that usually outweighs less urgent considerations of conservation. Social patterns likewise are a landuse factor. As they affect the interests of the individual operator, economic and social influences are as much a part of the problem of soil conservation as the purely physical processes through which soil is washed or blown away. These words, written by Bennett in 1939, are as valid today as they were seventy years ago. Bennett, H.H., 1939. Soil Conservation. McGraw-Hill Book Company, New York, 993 pp. 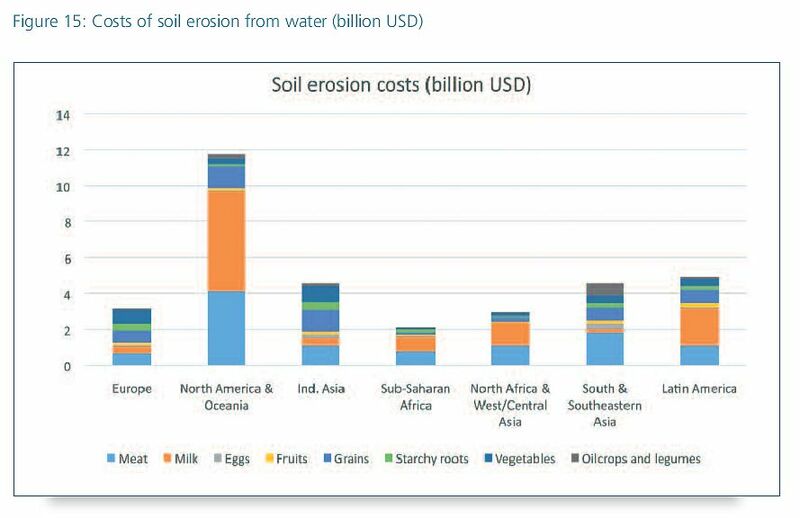 Costs of soil erosion by water worldwide (from: FAO, 2014. Food Wastage Footprint ). The state of the art of soil erosion research in Europe has recently been described in great detail in the book Soil Erosion in Europe . The present website is meant as an inventory and overview of the current state of soil erosion control in Europe. The intention is also to make existing information on soil erosion control practices readily available to farmers, farmer's organisations, policy makers and other interested parties in Europe. The site is a collection of links to erosion control efforts in individual European countries that can be found on the Internet. The site is far from complete. Many countries are still lacking. Additions to the links below are therefore very welcome. So, if you know of any initiatives or regulations to combat soil erosion in Europe, please let me know. The site only deals with soil erosion by rain, not by wind. It does not deal with other forms of soil degradation than erosion. 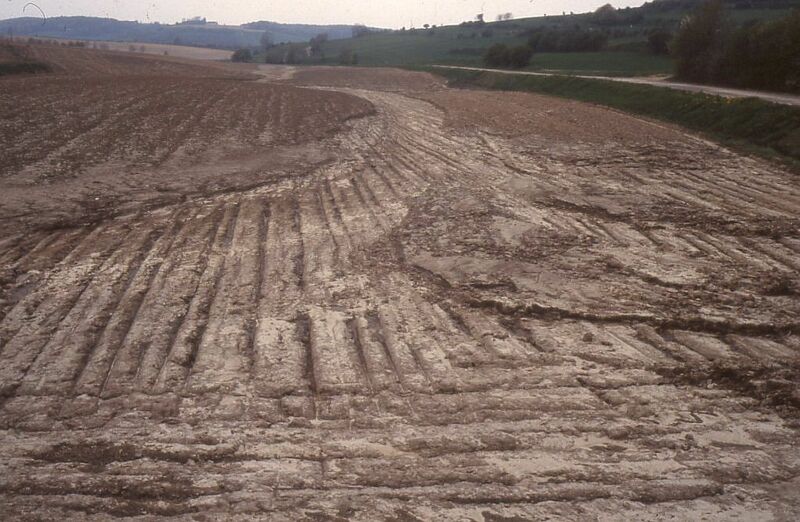 Soil erosion control has not generally received sufficient attention in Europe, until recently. 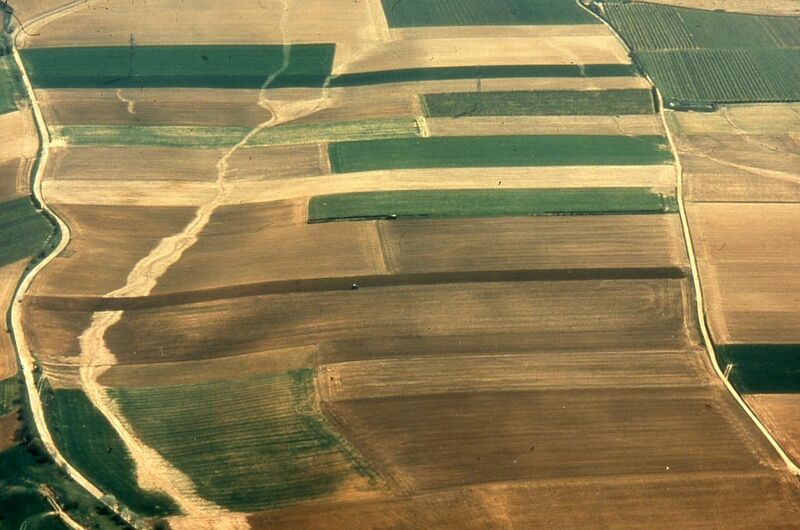 In most European countries, scientific interest in soil erosion arose in the 1970's. This was due to: (a) changes in agriculture (larger fields, more row crops, heavier machines), leading to an aggravation of erosion, and (b) a growing interest among earth scientists in the rate of operation, controlling factors and mechanisms of the so-called landscape forming processes, such as slope wash or hill wash. In some countries, concern for soil erosion is (much) older, like in Iceland, Poland, Bulgaria, Moldavia and Portugal. Today, there is sufficient knowledge in Europe to apply erosion control techniques and to experiment with the efficacy of those available. Not enough is done, however. Much of the failure to address the on- and off-farm impacts of soil erosion is a result nót of technical inadequacy, but of a failure to recognise the importance of socio-economic factors in influencing erosion (Soil Erosion in Europe, p. 485). Erosion (by rain) is a natural process on sloping land. It is the detachment and downslope displacement of soil particles by raindrop impact (splash) and running water (overland flow). Under natural vegetation (e.g.forest) the rate of erosion is very low. The vegetation protects the soil. This is called 'normal erosion' or the 'geologic norm of erosion'. When the natural vegetation is removed, as in arable farming, the soil is exposed to rainfall and the rate of erosion may increase 100-1000 fold, compared to forest. This is called 'accelerated erosion' or 'soil erosion'. Thus, soil erosion is an (unintended and unwanted) consequence or side effect of agriculture. Most farmers nowadays are aware of this and are willing to take measures to counteract erosion, in their own interest and that of others. There are costs involved, however, and it may be necessary to induce farmers to take action. Incentives may be in the form of regulations or legislation, together with financial compensation (subsidies, tax reduction). The most recent study (on a European level), how to encourage farmers to adopt soil conservation practices is the SoCo-project. It was launched by the European Commission for the period 2007-2009. Legislation is not primarily enforced upon farmers because of the irreversible loss of fertile topsoil and damage to the land, but because of the so-called off-site effects that accompany the loss of soil from cultivated land. The soil that is washed away, is deposited as mud on roads, in roadside ditches, in culverts and sewers, in the gardens, basements and cellars of houses, in the streets of built-up and residential areas and in rivers, dams and reservoirs. So, there may be serious damage to public and private property outside agriculture. 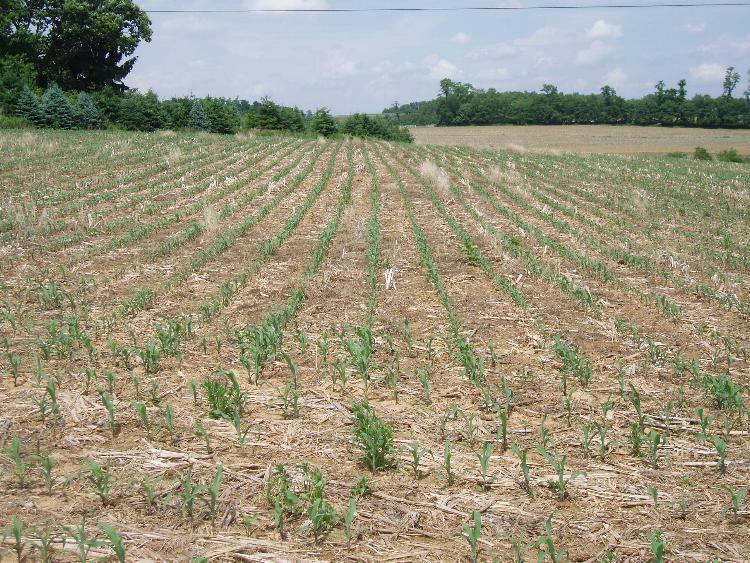 Soil erosion is often also accompanied by flooding, and water quality may be impaired by erosion-derived agrochemicals. Legislation only exists in a few European countries today. 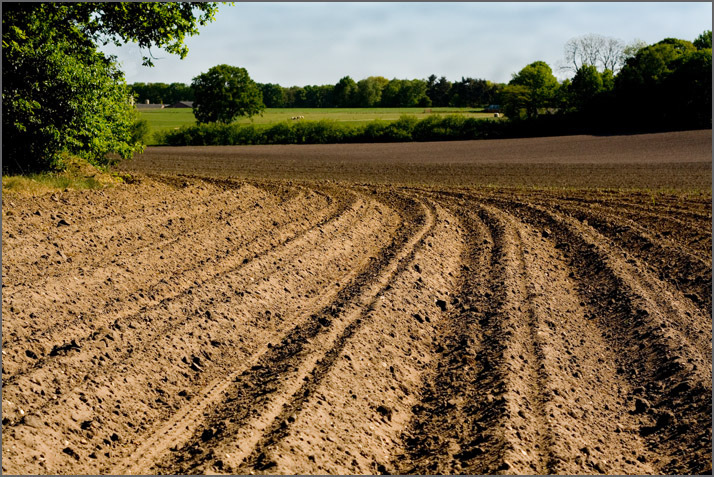 Many measures to prevent or reduce soil erosion are known since the 1930's, mostly developed in the USA. These measures need to be adapted to local conditions of climate, soil, slope and field length and the type of crop that is grown on the eroded fields. In general, we have a fair understanding of the mechanisms and controlling factors of soil erosion and of the basic principles of soil conservation. However, applying this knowledge to a given local context seems to be difficult. Empirical tests (on plot and field scale) with local crops and local farming systems are necessary to establish conservation techniques that are effective and feasible. It is here, that farmers and scientists must work together and bring in their skill and expertise. Farmers can contribute their practical experience in land management, and scientists their fundamental knowledge of erosion processes and soil properties. This co-operation is best achieved on experimental farms, where the different interests of farmers and scientists may fruitfully come together. Ingram discusses in detail the different outlooks of farmers and scientists in England, Switzerland and France on soil erosion and conservation. This is a very important issue that may complicate the application and implementation of erosion control measures considerably. Click here to read the paper. Most promising for the future seems to be so-called conservation tillage, in its various forms (minimum tillage, zero tillage, no till, direct drill, reduced tillage, strip till, mulch till, non-inverting tillage). Ephemeral gully crossing a number of arable fields in the hilly loess district of Dutch South Limbourg after 55 mm of rain in 2 hours incl. 30 mm in 30 minutes (Photo D. Koeman). Ground view of same ephemeral gully as above. 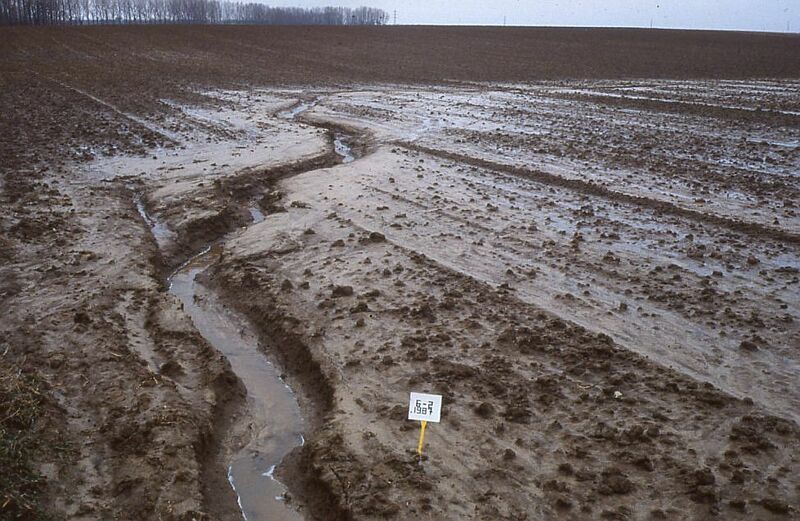 The plough layer was washed away on recently drilled fields (Photo F. Kwaad). Gully erosion in loess soil in Dutch South Limbourg (Photo F. Kwaad). 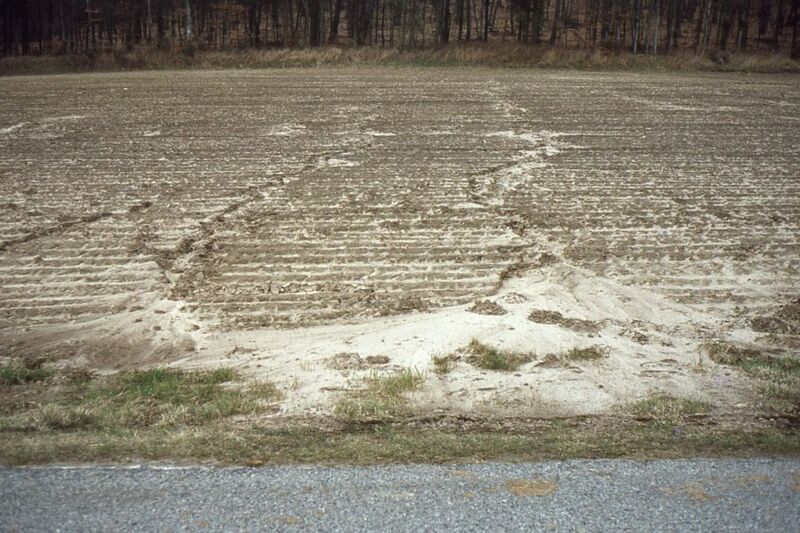 Deposition of eroded soil in the corner of a sloping field in Dutch South Limbourg (Photo F. Kwaad). 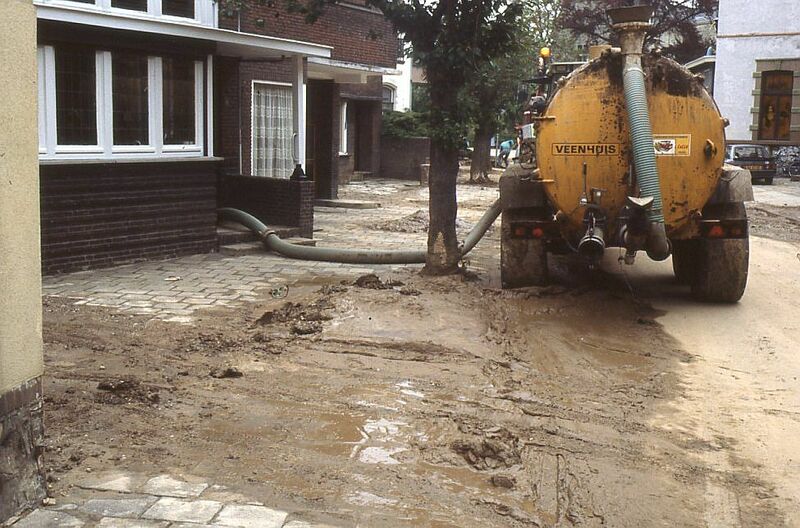 Mud on the street and pumping of cellar in Valkenburg, Dutch South Limbourg, after an erosion event (Photo F. Kwaad). Keep in mind, that more may be going on to combat erosion in Europe than is reflected on the Internet. Please, report any broken links. The site is regularly searched for broken links with W3C Link Checker. Is there a role for conservation agriculture in Europe, 2009? Land Use Policy, Volume 27, Issue 1, Pages 1-94 (January 2010) "Soil and Water Conservation Measures in Europe"
Soil conservation research using a rainfall simulator on experimental plots in Wijnandsrade, South Limbourg, The Netherlands (Plots laid out and photo F. Kwaad). 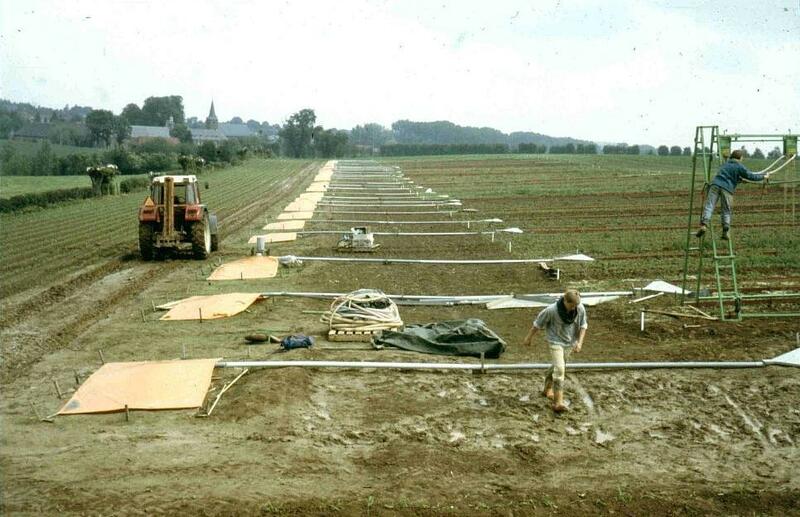 Multislot divisor for sampling runoff from an experimental plot (Photo F. Kwaad). Infokrant "Werk maken van erosiebestrijding"
Brochures "Werk maken van erosiebestrijding"
Additions for Spain, Portugal, Italy and Greece are welcome. See below for Spain. 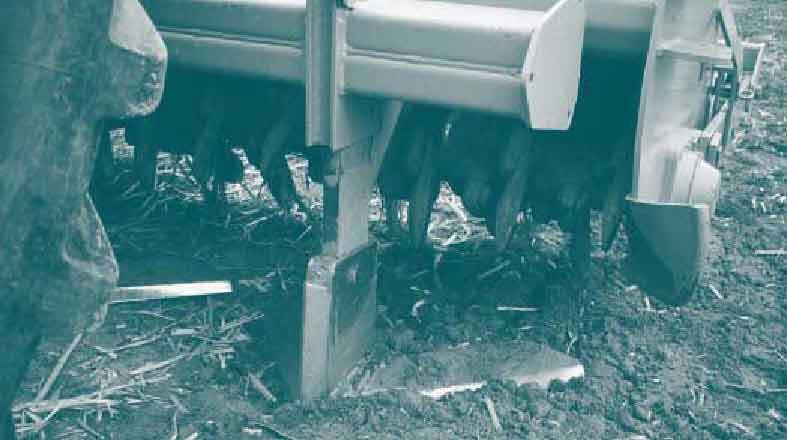 A special form of conservation tillage is subsurface tillage, i.e. 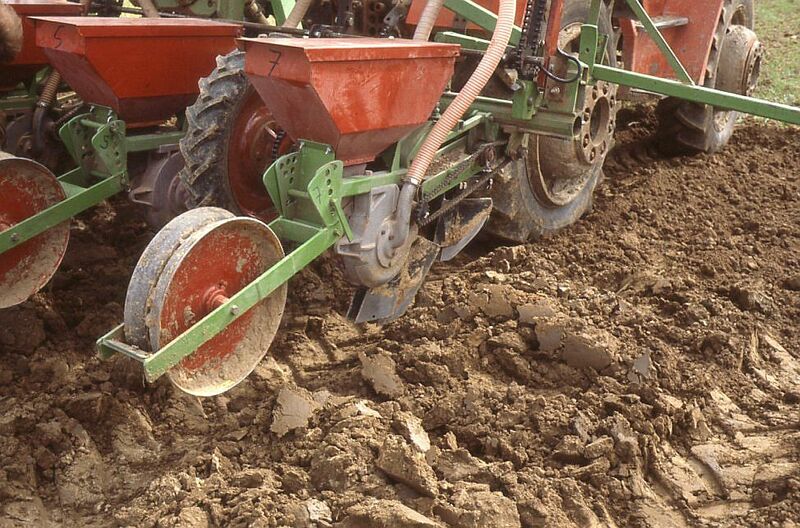 non-inverting tillage with a type of plough that cuts a slice of soil loose from the subsoil without inverting it. As of 3 April 2008, farmers in Dutch South Limbourg can apply for a subsidy of 50 Euro per ha per year for adopting non-inverting soil tillage. Starting 2013, conventional ploughing will no longer be allowed in the region south of Sittard. Click here to see the regulation. Click here for a recent paper in the European Journal of Agronomy (Vol. 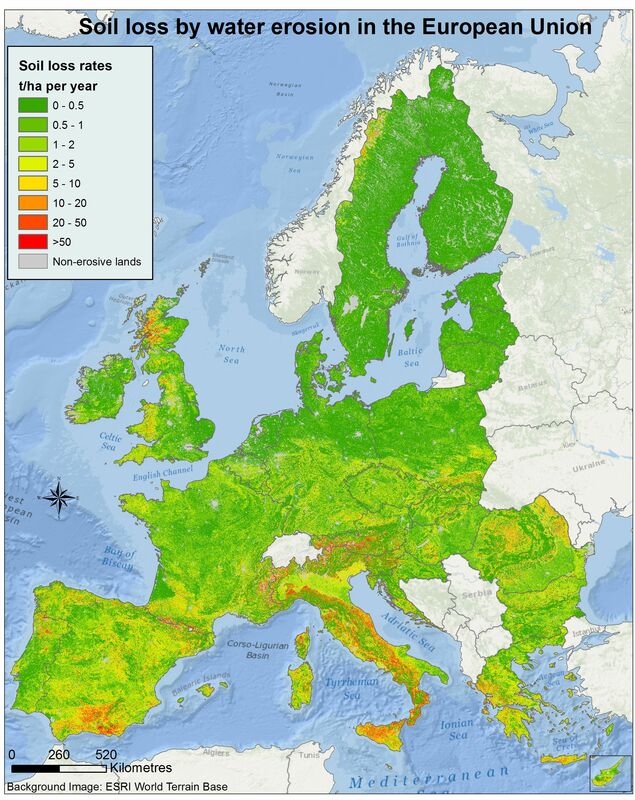 33, 3, October 2010) on the effect of conservation agriculture on crop yields in Europe. 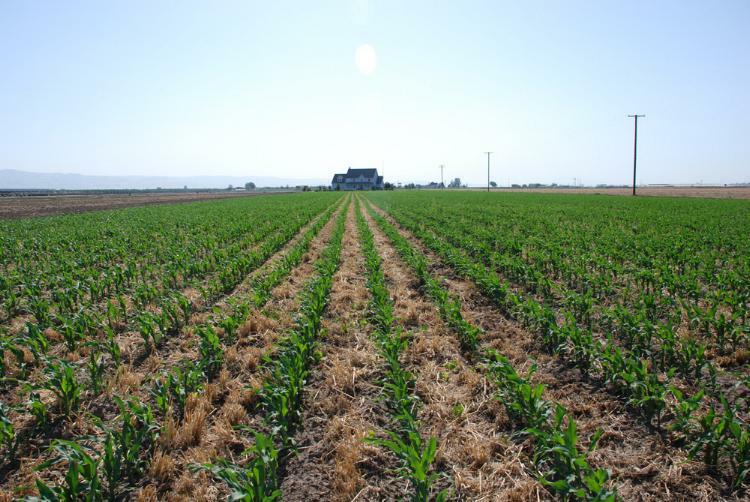 (a) Providing the soil surface with a protective cover of growing crop and/or crop remains at all times; this prevents crust formation by raindrop impact (so called surface sealing) that would lower the rate of infiltration of rain water below the rate at which the rain falls. 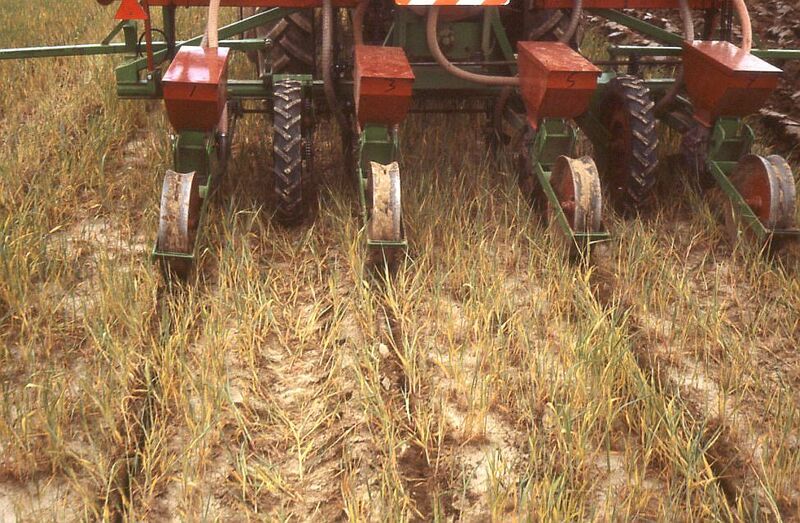 (b) Conservation tillage helps forming and maintaining a water stable soil structure. By conventional tillage a mechanical, so called fragmentation structure is formed, the elements of which (clods) are not stable in water. Under permanent vegetation a surface horizon is formed with biogenic aggregates (peds) that are stable in water. 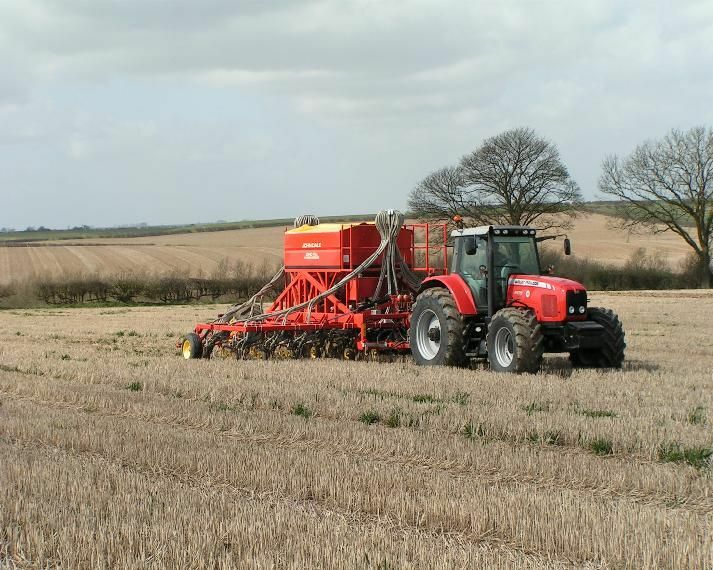 A stable soil structure is an important defence line against soil crusting. Crust formation on bare soil. Aggregate breakdown hinders infiltration of rainwater and causes surface runoff (overland flow) on sloping fields (From: Chapter 6 in Sare). See Imeson and Kwaad, 1990 and Kwaad-Mucher, 1994 for more information on the causes and mechanisms of the breakdown of soil structure. Infiltration excess overland flow occurs when high intensity rain falls on a crusted or sealed soil. It can begin immediately at the onset of rainfall, even on a dry soil. This form of overland flow is called Horton or Hortonian overland flow. Controlling variables are rainfall intensity and infiltration capacity of the soil, both expressed in mm/h. Another possible cause of overland flow is the presence of an impeding layer at shallow depth in the soil. During prolonged rainfall a perched groundwater table can form above the impeding layer that may reach the soil surface. Lateral subsurface flow over the impeding layer (throughflow, interflow) is involved in this, resurfacing at some point downslope (return flow). When and where the groundwater table is already at the soil surface at the start of rainfall (such as can occur along rivers and in lower parts of the landscape), overland flow can begin immediately, irrespective of rainfall intensity. The latter two forms of overland flow are called saturated or saturation overland flow. Controlling variables are rainfall amount and available storage capacity of the soil for water, both expressed in mm. An important controlling factor of soil erosion is the soil erodibility factor or K-factor in the Universal Soil Loss Equation (USLE). The value of this factor for Europe can be found on a K-factor map that was recently published in "Environmental Modelling and Software" (November 2011). This map provides a complete picture of the soil erodibility in the European Union member states. It is derived from the LUCAS 2009 point survey exercise. The soil erodibility dataset overcomes the problems of limited data availability for K-factor assessment and presents a high quality resource for modellers who aim at soil erosion estimation on local/regional, national or European scale. The dataset is in raster format and can be accessed on request. Direct drilling of maize in winterrye as winter cover crop, Experimental Farm Wijnandsrade, The Netherlands (see detail of sowing machine) (Photos F. Kwaad). 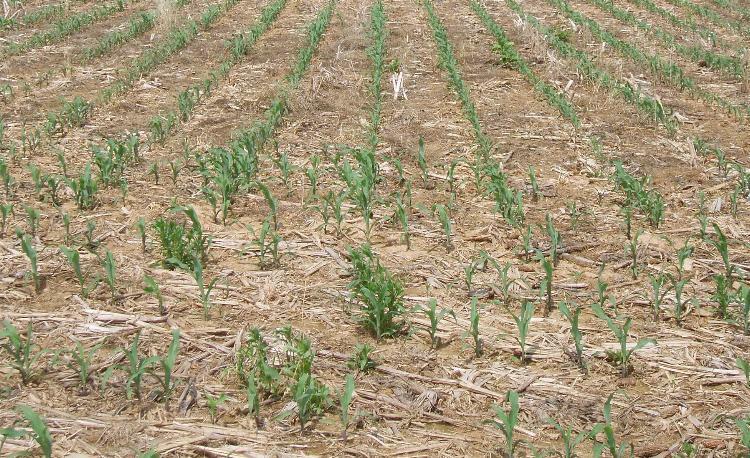 No till corn after corn (From: Wendy Kindig ). Click here for detail.